Day 87: Fired BP Cleanup Contractor — Alleges Cover-up ? In a story being reported by WDSU, alleging cover-up — A former BP contractor said Friday evening he was dismissed after taking photos that he believes were related to the use of dispersants and to the cleanup of the oil floating in the Gulf of Mexico. Adam Dillon worked as a liaison on Grand Isle early this summer. He later moved to a position at the BP Command Center near Houma. In June, Dillon was there when security teams rebuffed WDSU anchor Scott Walker as he tried to speak with workers on a public beach. But Friday, while driving home to North Carolina, Dillon contacted Walker and said he wanted to talk about his experience. Dillon said he decided to talk because of what he saw happening in the cleanup effort and because of the way his role in that effort came to an end. Is there finally hope for the Gulf? Think “Whale Shark”, that skimmer feeder, swimming the oceans of the world, gathering up plankton. A barge manufacturer thinks he has the answer, so he has come up with the latest solution “Big Gulp”. The picture below shows how it works. It’s just an offshore barge, with a collection skimmer all across the bow. Pushed through the oil with an offshore tugboat. The decanting part, oil separation, is done inside, with multiple settling tanks. Oil floats on water, remember that part from science class? You did take science, they do still offer it, don’t they? The 300 foot long barge Big Gulp heading out, being pushed by an offshore tugboat, through oceans of oil floating on the water. Offshore barges have no engines, which is what makes them ideal for this decanting work. Basically Big Gulp does it’s work by sucking in oil and water through the bow, into decanting tanks, allows the water to settle to the bottom, where it gets pumped overboard — Simple separation science. NOW THAT THE EPA’s 15 ppm DISCHARGE WATER STUPIDITY was done away with. The barge builder has plans for several more “Big Gulp” barges to be built, he is currently working on “Little Gulp” for shallower water use. Read the story of American ingenuity and inventiveness, something total missing from the drones inside places like the EPA. You see the underwater pictures on TV, but the scale is hard to figure out. Here is what the new capping stack, with valves, for the well looked like with some size references. It weighs in at about 75 tons total. This is a photo taken during testing on land before being lowered, and placed on top of the well. The cap has now been lowered and placed on the well. Pressure test follow. If the pressure test shows results within expected limits, then the well may be just left closed in. If the pressure is lower than expected, then the capping valves will have to be reopened as that lower pressure would be from the lower casing leaking oil into the surrounding rocks. 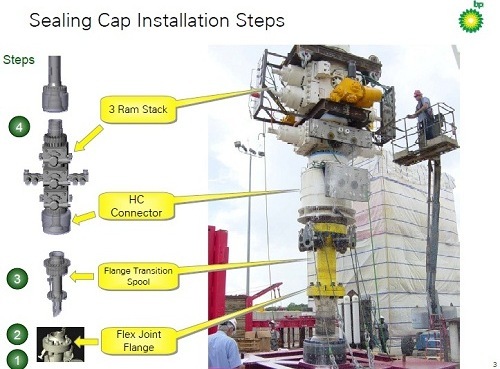 If the well casing is showing signs of leaking, then the top of the stack will have to be connected up to a oil recovery ship and the oil outflow siphoned off. 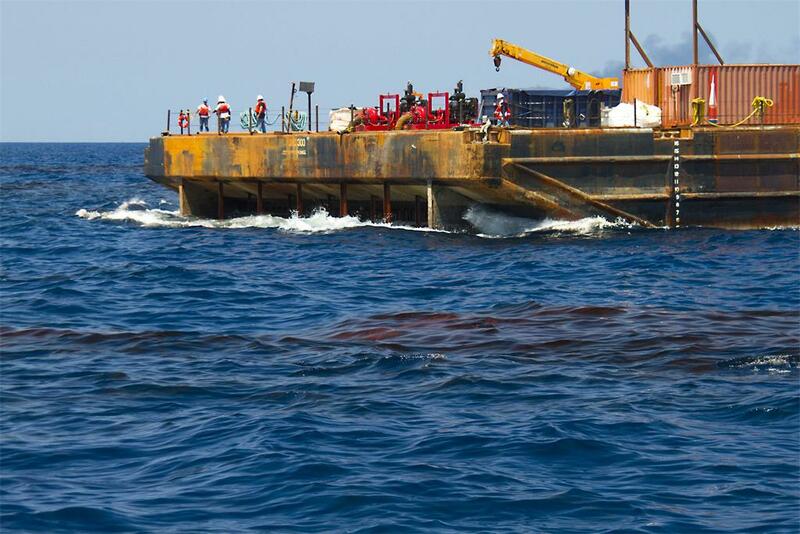 Hopefully, either way, the amount of oil leaking into the Gulf may be significantly reduced. Here hoping…. BP has an animation here, which shows how the new cap is installed. Now if only the federal government’s containment and cleanup had been anywhere as good, the damage to the Gulf and surrounding area would have been minimized — Just as the OPA 1990 called for. But sadly, our incompetent Obowma and his incompetent minions were not prepared, and damage will be severe. Big Government, too big to fail, and that means who needs plans and procedures for things we know will never happen. So answer me, why did the government even bother to write the oil spill emergency containment and cleanup plans and procedures down? Is there any wonder they have now made it a class D felony and a $40,000 fine for news people to report on what damage has been done. All in the name of transparency, I am sure. BP managed to get the 75 ton valve assembly atop the BOP and bolted down. Next step is to check the pressure in the well casing and be sure it can stand being shut-in. If so the leaking well could be valved off. If not, BP will connect a collection line to siphon oil out until the now being drilled relief wells reach the stricken well casing and do the famous ‘bottom shot’. After completing the pressure testing, BP will announce what is next. Standby, we may know the results by days end. It would appear the presidential part of the Obamaspill, containment and cleanup, is a dismal failure. Obamaspill Day 69, the ship “A Whale” is headed to the Gulf. No word on whether the ship and non-union crew has the necessary permits and waivers from our massively incompetent federal bureaucracy yet. 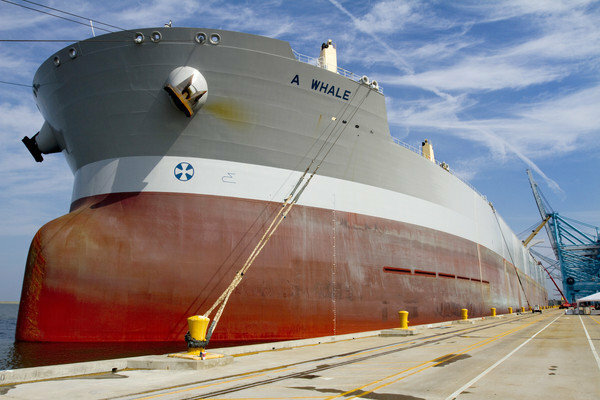 “A Whale,” billed as the largest oil skimmer vessel in the world, is seen docked at Norfolk International Terminal on Thursday, June 24, 2010. 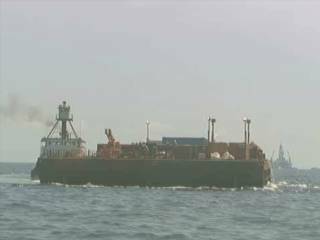 It was to set sail today for the Gulf area, where it hopes it can be put into use with BP Deepwater Horizon oil spill cleanup efforts. Obamaspill hits Florida, big time. A section of Pensacola Beach has been closed because of oil that washed ashore there. Government officials closed a section of beach on Thursday. Thick pools of oil washed ashore there Wednesday. Workers ran yellow tape 75 yards back from the water. Officials say the area was closed because heavy equipment is being brought in to clean up the mess. Unfortunately it’s getting larger and it’s going to be trouble. You are currently browsing the archives for the Obamaspill category.